‘LOKTRAYASHRAY’ as the name itself suggests lives and grows to bring under its large and single tree the individualsfrom all thoughts and facets of society.’LOKTRAYASHRAY GROUP’ has been formed with the prime objective to inspire, assist and motivate, to create a self-belief in all those who aspire and dream to prosper and make it big in life. At ‘LOKTRAYASHRAY’ we are committed to assist its customers in making them ful?l their such dreams and desire, we believe we have been mandated tocarry out this blissful &amp; divine contribution to the lives of all those who wish and dream to make it big in life irrespective of what they and where they stand at the present moment. We pledges to bring a lasting value in to the lives of its customers. Irrespective of how rich, powerful and influential one is, nature does not give a few crucial assets to any one any less or any more. It is up to the individual what best can he make and create out of the bagful given by God or Nature..more of which cannot be created by anyone. Hence, since the time immortal is said that ‘Time is Money’ and the discovered fact of the present times is that ‘Land asset today has become Gold’. ‘Lokatrayashraya’ having well mastered the strategy and the art of spotting and cashing in early on the opportunities of wealth creation, extends a dependable and reliable hand to its customers for a long term mutually bene?cial relationship. 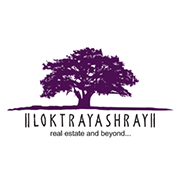 ‘Lokatrayashraya’ offers a wide variety of land and developed real estate property product options to suit, ful?l and satisfy the varied needs and preferences of each individual. Along with a variety in the product mix it also attempts to be most ?exible for accommodating speci?c choices, needs and requests of its customers. This comes predominantly from the above said divine belief about the larger cause, for which we are in this business activity. For ‘Lokatrayashraya’ clearly it is never for making mere and only pro?ts for ourselves that it came in to being and continues to expand and grow. And this objective, belief and philosophy is precisely what our logo of large wide and a kind tree symbolizes. We have various natures of relationships in the ‘Lokatrayashraya family’ in which you could connect with us in a long lasting healthy relationship that makes possible symbiotic and sustainable mutual growth. We wholeheartedly and warmly invite you to become a part of our large family under the strong, kind, caring &amp; ever growing divine tree.